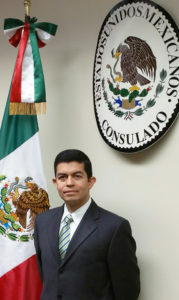 In his 23-years diplomatic career Consul Navarro-Bernachi has served in several consular and political capacities in the Republic of Ecuador, as well as in San Diego, CA and Phoenix, AZ. Before taking office in Kansas City, he spent 5 years at the Secretariat of Foreign Relations’ headquarters in Mexico City, where he was Deputy Director General in the Directorate General for Protection of Mexicans Abroad. He has a Major in Communications and Journalism and a Master Degree in Diplomatic Studies.